In the Summer and Fall of 2017 we witnessed many natural disasters in our world seeing everything from fires to floods, hurricanes and earthquakes. I have a family of 5 and it made me wonder what would happen to us if we had ‘the big earthquake’ that is overdue here, in Utah. As a mom I feel it is my responsibility to take the measures necessary to make sure that we would survive if something like this happened. I did my research and ended up putting my own 72 hour kits together. It took some time and some money but I did it. 6 months later I found these amazing pre-built bags, a 72 hour kit made easy by Thriv3 on Amazon that I wish had existed instead of building my own! Here is the deal, in the midst of all of the chaos and natural disasters I couldn’t sleep one night. I kept thinking about it and I had anxiety. I got on my phone, researched Pinterest, Amazon and Walmart but couldn’t find a good quality pre-built kit that I felt comfortable with. So I spent the next few hours price comparing, reading reviews on 72 hour kit essentials, researching the necessities, etc. I didn’t go to sleep until at least 3am! I ended up buying everything individually for my family of 5 between Amazon and Walmart. It wasn’t the easiest way to do it, but I got it done. This past weekend Thriv3 just released a pre-built 72 hour kit. I was able to review what products were in it, the quality, and the price point. I love how this backpack fits everything in ONE BAG versus having each child having to carry their own. Keep in mind however, your child can still carry a backpack if needed to flee your home with light weight items in there like an extra change of clothes, hygiene items, etc. THRIV3 has partnered with many superior brands to provide you with necessary tools, peace of mind, and the confidence you need to get through any emergency or natural disaster. 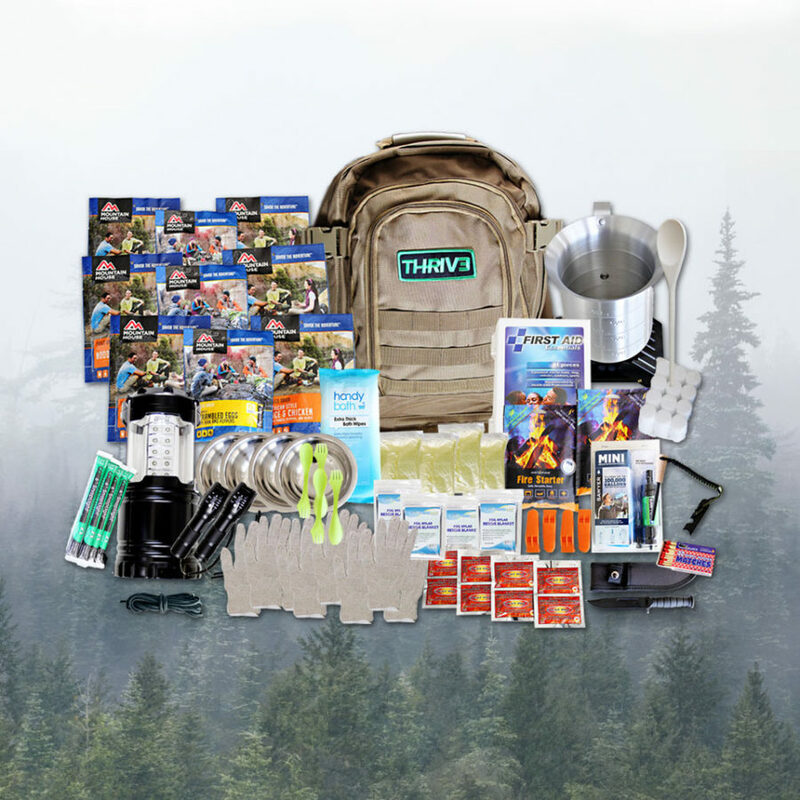 Brands included in the THRIV3 3-day survival pack are: Mountain House Freeze Dried Food, Sawyer Water Filter, InstaFire, First-Aid Only, and Coghlan’s. I love their slogan, “Don’t just survive, THRIV3”. The kits I made on my own would surely get us through 3 days but I’m not sure if we would be getting the nutrients we really needed to THRIVE. The food items I put in them were things like granola bars, dried fruit, peanut butter and crackers, fruit snacks, etc. I really love the piece of mind I have knowing we’d be getting a decent meal rather than just non-perishable packaged goods for three+ days. Each food package in this kit contains 2-3 servings!! I have had so many questions about 72 hour kit advice from my followers on my Instagram, after doing a live video awhile back. I wanted to share this with all of you so that you realize you don’t have to stress about putting your own bags together. It’s so nice to start with a pre-built bag like this, then add other items you think you’ll need. 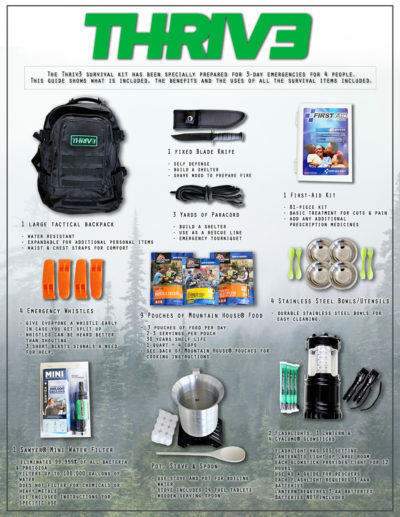 So there you have it, a 72 hour kit made easy by Thriv3. I promise you after you get these essentials that you will have a piece of mind and hopefully won’t go into anxiety mode like I did! 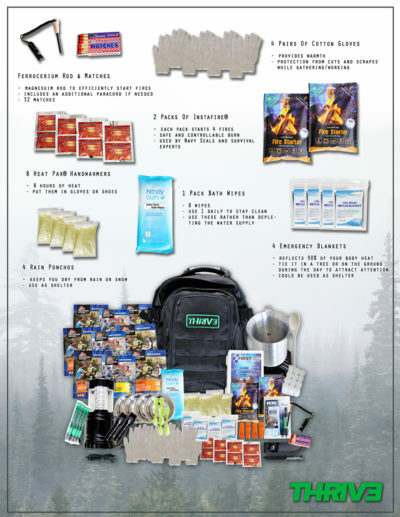 Purchase your 4 person Thriv3 3-day survival kit HERE.